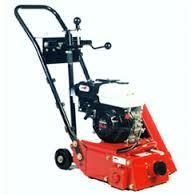 Designed for a wide range of concrete removal, repair or restoration job applications. The exclusive drum forward configuration was specifically designed for sidewalk trip and fall type removal projects. Welded, unitized frame construction with full length, hexagon driveshaft for maximum power transmission to the flail drum. Extra capacity, ball bearings are externally greased to extend their service life. The Quik-Pitch® lever/drum engagement system features a separate, fine adjustment for precise control. Standard 8 inch (203 mm) drum width and 5/8 inch (16 mm) maximum cutting depth. An industry standard 3 inch (76 mm) diameter vacuum system port is provided for use with appropriate industrial type, dust control systems. Includes one drum, less flail kit.